Opening Tuesday January 17 at The Living Gallery, 6 pm to 9 pm. One night only. 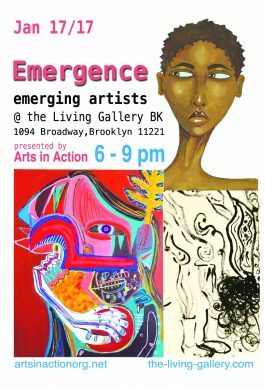 The term “emerging artist” has been a bit of a buzzword for quite some time now. To some, it means someone who has literally just started creating, to others, it is someone who’s been on the scene for a couple years but hasn’t won any fancy awards. And sometimes it’s somewhere in between. But this art show really owns the title in a way that’s clear: simply, Emergence is showing work by New York artists who have never shown their work in a gallery before. There will be over 20 artists covering the gallery in their work, whether it be painting and sculpture, performance, or even fashion pieces. Come one, come all, and witness the emergence.